Dr. Dane Becker is a West Omaha chiropractor who is also a Certified Chiropractic Sports Physician (CCSP(R)). He studied Exercise Science before entering chiropractic college, and as a former football player, he experienced all that chiropractic can do for athletes. Exercising is a necessity when it comes to staying healthy, but sometimes, it can take a toll on your health. 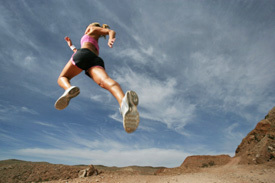 Running is particularly tough on the body, wearing out the joints in your legs, hips and lower back. Even the smallest injury can turn into a huge problem when you’re training on a regular basis. There are a few simple ways that you can make sure your body is ready to take on anything, from a light jog after work to a more serious competition. Consider cross training. Rather than concentrating solely on running, try some other types of workouts, like swimming or taking an exercise class. It’ll lighten the load put on your joints and help you strengthen other areas of the body. Warm up. Rather than thinking a slog jog at the start of your runs is a warm-up, try walking or do some stretches to get your body ready. Remember to ice. Your joints can be sore after a run, especially if you’re going longer distances. Applying ice to them can help the pain and reduce the risk of any lasting effects from the discomfort. Call Becker Chiropractic and Acupuncture, we understand the needs that running can place on your body. then we’re ready to help you achieve your best time yet!